These. Oh lord almighty. These. 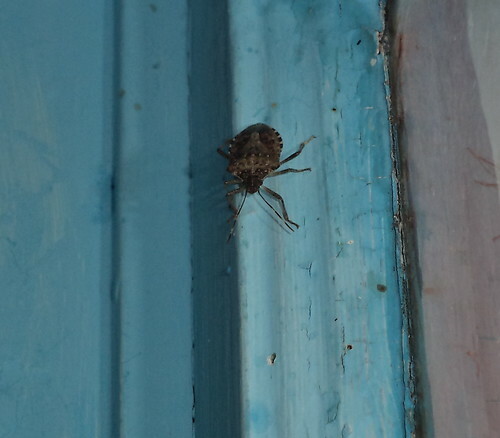 In case you don't have these and have no idea why I'm up in arms over something squashable, this is a stinkbug; a brown marmorated stink bug, to be precise; halyomorpha halys. They are native to China but, as with a lot of nuisance insects, were accidentally introduced to Pennsylvania in the late 1990s. They are considered a noxious pest and damage fruits and vegetables. In late fall, they will enter homes to hibernate. Because they are around half an inch long, any kind of gap will allow them entry. They overwinter and come out in the spring, when air temperatures reach a consistent 60 degrees during the day. The interior warmth of a home, however, will cause them to come out during the winter. They are attracted to lights and will fly around a ceiling light, for instance, colliding with it. It's fairly easy to swat them out of the air. Their common name, "stink bug", is from the pungent odor produced when the insects are mating or are crushed. Some people consider it freshly crushed coriander. Some people, myself included, think it just stinks. I generally try to pick them up in a tissue, wrap it into a tight ball and flush. If we were having a normal winter, where the highs were in the upper 30's, I wouldn't see them all winter. As it is, we've had 40's, 50's and close to 60's this winter. Couple those temperatures, with the warmth from the inside of my house and I have seen close to two dozen of these pests this winter. It's beyond aggravating to be reading in the evening and have one drop out of the air onto your book page. I was doing dishes last night and one had found its way under the dish drainer. I'm going to have to take the drainer apart, pick it out and toss it away. If I find them in the kitchen, I give them a heave ho out the door."Freeze!" I usually say. They are probably finding some way back into the crevasses of the house, but, for a moment, I feel good about inflicting death on a noxious creature. I generally believe that everything which evolved on the planet has a checks and balances and has, in some way, a good reason for existing. Mosquitoes, for all the disease they bring, are, in larval stage, fish food. Controls which involve putting a thin film of oil on top of a pond, for instance, which suffocates the mosquito larva, also kill fish. Bats love fully grown mosquitoes. There needs to be a balance in how many we preserve when they are food for other creatures. But, I fail to see what could find food in stink bugs. I'll also add June bugs to that short list. June bug larva get dug up by skunks and that's a nuisance of itself. I can always tell when there's been a skunk through my yard by the small circular holes in the grass where a bug was found. So, die stink bugs, die. The girls will watch them circle a light but aren't inclined to go after them to kill them. The only good thing about these is that killing one helps with eye hand coordination between a fly swatter and a flying insect.